It’s a question that’s absolutely critical when judging a closed-end fund: how safe is the dividend? This is particularly crucial when you consider the huge yields the average CEF offers compared to their ETF cousins. For the 2,918 ETFs available to US investors, the average payout is 1.9%, partly because 735 of these funds pay nothing at all. But even without those, the average ETF yield is still a pathetic 2.5%. CEFs? For the over 450 covered by my CEF Insider service, the average yield is 7.3%, and only nine yield less than 1%. In fact, over 85% of CEFs yield more than 4%, while just 9% of ETFs do! How can CEFs pay so much? Cynics will say it’s because CEFs sacrifice returns to goose payments. 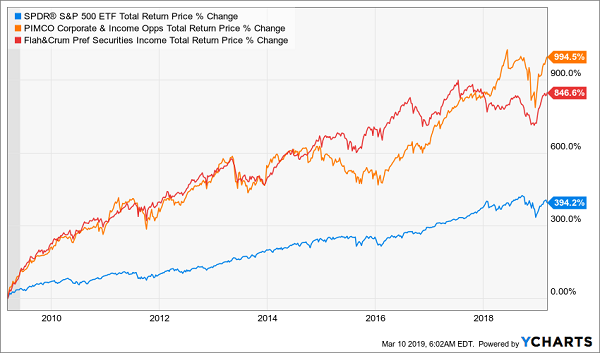 I’d respond by saying that over 100 CEFs have outperformed a comparable index fund. And even a CEF that matches its benchmark crushes ETFs, because it gives you a bigger slice of that return in cash. 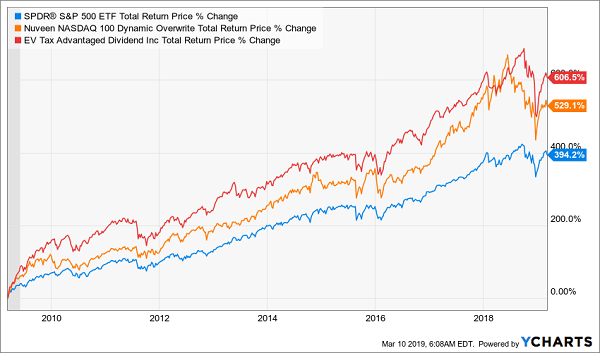 So let’s dig into the three major ways CEFs pay out those huge dividends. Along the way, we’ll uncover six funds paying upwards of 7% and crushing benchmarks left and right. We’ll also unmask one dividend pauper you need to dodge—or sell now if you own it. The simplest way for a CEF to give us a big income stream is for it to buy investments paying big dividends themselves, then hand that cash over to us. CEF managers’ favorite high-yield plays: municipal bonds, for the high, tax-advantaged payouts they provide. 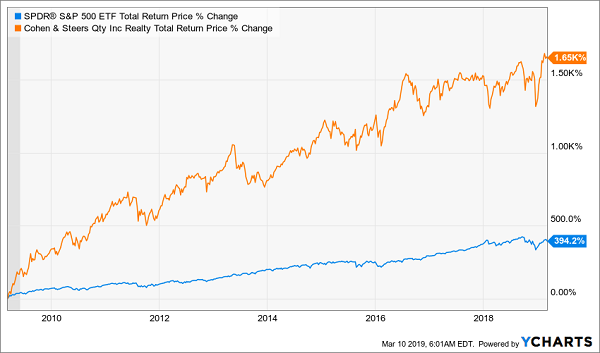 But these pros also tap other big income earners, like high-yield (sometimes called “junk”) bonds, corporate loans and real estate investment trusts (REITs). PTY yields 9.1%, and FFC pays 7.1%, showing yet again how a CEF can deliver massive returns and big yields at the same time. Going with high-yield investments isn’t the only way to bring home the dividend bacon. Thanks to a number of well-managed equity funds, CEF investors have enjoyed 7%+ yields and market-beating returns over the long haul. These funds invest in a portfolio of stocks, maybe collecting some income along the way through dividends or options and other derivatives on those stocks. But management mainly rotates out of overbought stocks and into oversold ones. With 7.9% and 6.9% yields, these funds provide a generous income stream to go with their market-crushing returns. Cynics take note. 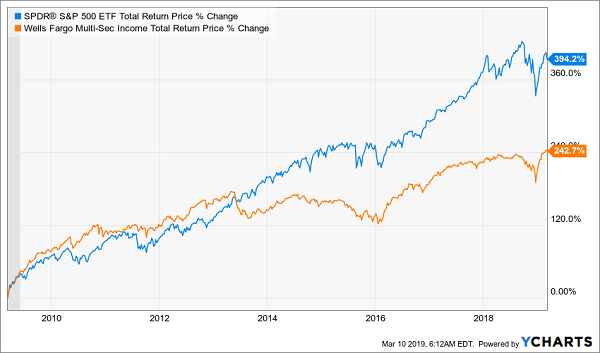 As you can see, ERC’s return is far behind that of the S&P 500, and its returns got worse in late 2013, just when stocks were getting started. The fact that ERC failed to keep up shows a flaw with the fund’s management, strategies or both. But the real problem is the dividend. 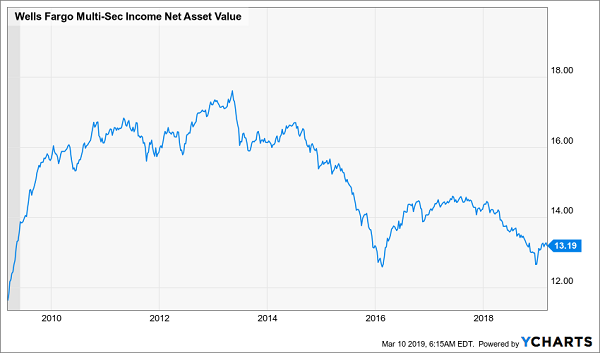 You can see here that ERC’s income stream has fallen throughout the 2010s, in part because its net asset value (NAV, or the market value of its portfolio) kept shrinking. What we see here is a consistent trend, from about 2013 on, of the fund’s NAV shriveling, with a particularly big dip in 2016 that ERC hasn’t come close to recovering from. 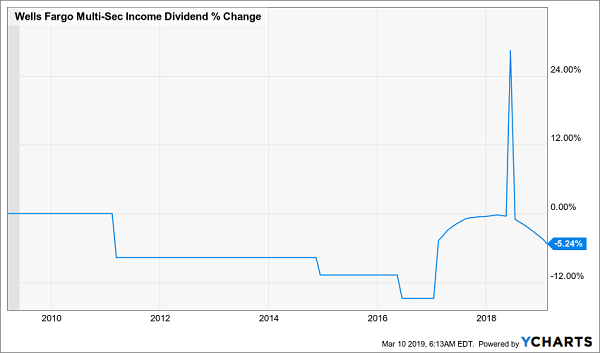 Yet management raised the dividend in 2017, just as NAV was in free-fall. This is a common ploy among CEF managers, and it’s one you need to run away from at top speed. To keep up high payments, a CEF will start to take money out of its portfolio and hand that over to us as a dividend. Right now, ERC pays what looks like an attractive 10.1% yield, but that’s an illusion. 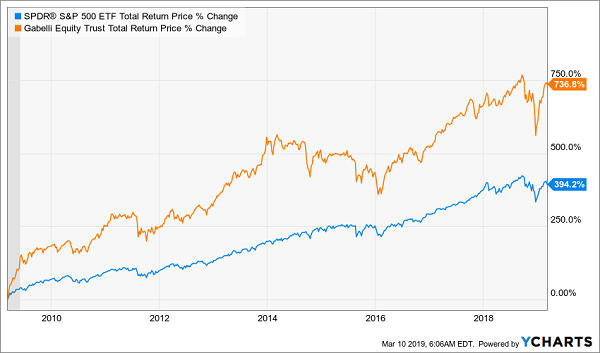 Unless management can stop its NAV from falling (it’s now near its 10-year low), it will have to cut dividends, as it did in the early 2010s. One final word: while you need to dodge funds like this, don’t let them dash your dream of high yields and big price gains, because, as we just saw, many CEFs give you both. Steering you away from the ERCs of the world and toward safe—and growing—7%+ payouts is exactly what I do in CEF Insider. And right now I’ll GIVE you my very latest high-yield picks: I’m talking about a fully stocked portfolio of 18 CEFs yielding 7.4% on average (with two throwing off monster payouts above 10%!). This portfolio is the beating heart of my CEF Insider service. The buys you’ll find there are poised to hand you 7% to 15% price upside in the next 12 months, thanks to the incredible discounts they’re trading at now. The entire wealth-building package is just a click away: Go right here to discover my 18-stock CEF Insider portfolio for yourself and get your Special Report on the very best CEFs to buy now. But in this time of market uncertainty anything can go wrong. I am sure these funds are NOT immune to recession BUT what extent ?